The Blue Lagoon is one of the best beaches in Malta, situated between the island of Comino and the islet of Cominotto.The crystal clear waters in Blue Lagoon reflect the blue sky with a lovely cyan as well as let you see the pure white sand bottom of this part of the Mediterranean Sea. This long and narrow bay surrounded by rock and a bit of sand is almost like a pool, which makes it the ideal place for swimming, snorkeling, scuba diving or simply relaxing on the beach. If you have children, they can play safely in the warm shallow lagoon while the family enjoys the Maltese sun, practises any of the water sports inside the lagoon or even water skiing in the deeper waters nearby. Visited by tourist boats that anchor in the marina-like bay throughout the day (avoid the weekends), the Blue Lagoon will remain empty at night, since the island only has an official population of less than ten people. This way, these Maltese waters are sure to remain clean and transparent for years to come. In fact, Comino and its Blue Lagoon are so beautiful that film makers used this location in scenes for such productions as the mini-series Helen of Troy or the films Swept Away (featuring Madonna) and The Count of Monte Cristo. 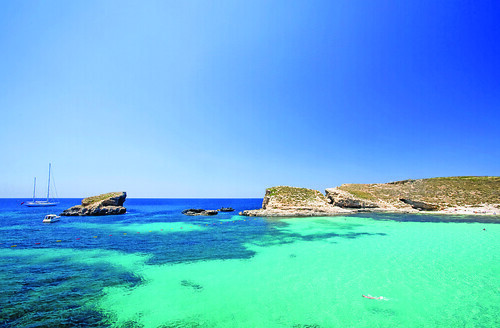 When staying in Malta, save at least one morning or afternoon to visit the Blue Lagoon and the island of Comino. During summer, the sun waits for you. In winter, the small Maltese island is an excellent destination for walkers and photo enthusiasts, providing many hiking trails all around. You can take a boat to Comino Island during the whole year using the round trips in United Comino Ferries. The Comino Hotel can also provide this service, but only when it’s open (April-October). If you’re staying at the hotel, it can even pick you up at the airport. During summer, in the areas with more tourists in Gozo or Malta, there will be boat services that will take you to the Blue Lagoon in Comino Island. However, be careful with boat ride times because the more it takes to get there, the less time you spend in Comino. It is probably better to take the bus to Marfa or Cirkewwa and then get on the ferry. With an area of only 1.35 square miles (3.5 square km) Comino was named after the cumin seed that could once be found everywhere in Malta. The rocky island of Comino is a bird sanctuary and nature reserve and very few people live there permanently. The peaceful landscape consists of cliffs, two small white sand beaches, coves and creeks. There are no roads or cars in Comino, only pathways where you can hike or ride a bike. Being an isolated rocky island, Comino has never had a lot of population but there are records of some farmers living there during Roman times. During the Middle Ages, pirates used to shelter and hide near the limestone cliffs in the rugged coastline and inside its caves. In the 13th century, Comino became a parish when the little Chapel of Our Lady’s Return from Egypt was built. We can still see this little church as well as the other ancient construction in the island, St Mary’s Tower. This fortification was built by the Knights of Malta in 1618 to keep the pirates away from Comino. The knights also ended up using the island as a reservation to hunt wild boar and hares and later on, during the 16th and 17th centuries, Comino served them as a prison or place to exile those knights who had committed minor crimes. Their punishment was taking care of the isolated St. Mary’s Tower. There is only one hotel in Comino, offering nice rooms for guests seeking tranquility, isolation and a place to rest. The main building of Comino Hotel is located above San Niklaw Bay. It has two private sandy beaches and two large swimming pools, one for adults and one for children. 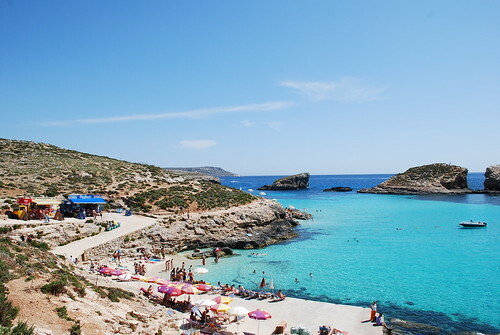 The Comino Hotel also provides holiday bungalows in the near Santa Marija Bay. They have a private rocky swimming area and another sandy beach one hundred meters away. The hotel is quite modern and has newly refurbished rooms with sea or garden views through a private balcony. All rooms have air-conditioning, direct-dial telephone, TV, radio and mini-bar.